A Playtdate Theater performance of "A Christmas Carol"
Did you know that you and your family can attend free plays at the St. Louis Public Library? Almost every month, the Central Library hosts “Play Date Theater” where actors put on live performances designed for the whole family, but focused on the short attention span of young children. 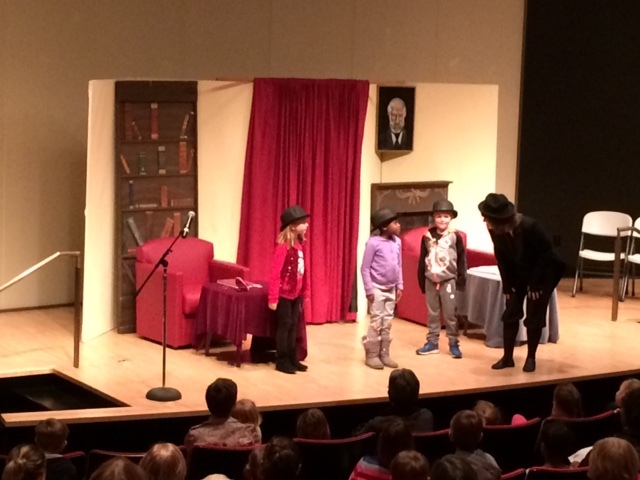 Play Date Theater is a great way to introduce children to the art of theater. Entertaining for older kids, but geared toward children preschool through Grade 2. December’s Play Date Theater “A Christmas Carol” presented by Hampstead Stage Company is an adaption of Charles Dicken’s Holiday classic. Performers remain in costume for a “Holiday Cookie” reception to follow. Play Date Theater is more than just a fun experience for the whole family. Attending a live theater production can open the door to literacy, increased vocabulary, and improved ability to read the emotions of others. And trust us, Play Date Theater’s “A Christmas Carol” will be a ton of fun, and a perfect way to introduce your little ones to Charles Dickens. Plus Santa will be there so make sure to bring your cameras.